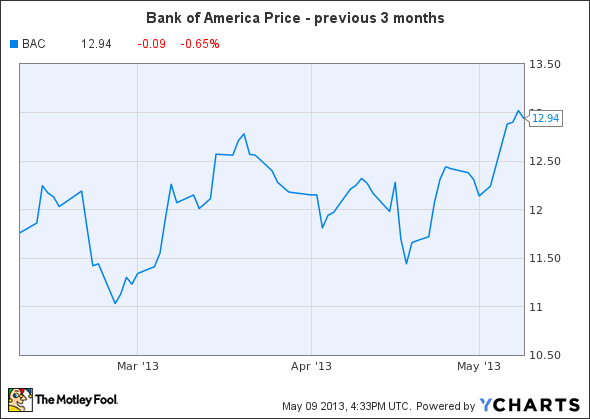 Is $13 the New Ceiling for Bank of America? Sometimes, a stock's price meets resistance at a certain point. Is its current level the max for B of A? Bank of America (NYSE:BAC) had a pretty decent week, relatively speaking. It was boosted earlier in the week when news of a settlement with MBIA reached the markets, and even some threatened legal action by the state of New York didn't affect it all that much. Even Friday morning, with Citigroup and JPMorgan Chase relatively flat, Bank of America remains slightly higher. In general, we at the Fool believe that daily stock price movements are unimportant unless there is some news surrounding the move. With a stock that gets as much coverage as Bank of America, however, sometimes it's important to see if there are any reasons why it's not moving and where it could ultimately end up. Source: 2013 First Quarter filings; prices as of May 8, 2013. Based on its book value alone, there seems to be plenty of room for Bank of America to grow. However, the consensus analyst estimate is currently $12.87, meaning it is trading just north of what the "experts" seem to think. Personally, I think the true value of the bank lies somewhere between its book value and tangible book value, so it's only a matter of time before it manages to leave $13 solidly in its rearview mirror as it heads toward these heights.